Some may call it a small city, and others may say it’s a big town. With its ever-evolving urban fabric, maybe it falls somewhere in between. No matter its designation, West Chester, Pennsylvania remains to be a bustling destination located right outside of Philadelphia. Home to one of our design offices (we’re located right on High Street next to the historic Courthouse), the county seat of Chester County, and West Chester University, the Borough of West Chester possesses a history rich with innovation, growth, and constant change – much like today. As if plucked right out of a Norman Rockwell painting, the idyllic borough boasts brick sidewalks and townhomes nestled among eye-catching buildings – both homes and businesses — preserved to the prowess of their Victorian era origins. The town’s center, made up of busy thoroughfares like Gay Street, High Street, and Market Street, is where visitors, working professionals, and locals alike enjoy shops, restaurants, and a slew of small businesses tucked within the cozy confines of the town proper. On the western side of town, at the corner of Gay Street and Church Street, a collection of large buildings lay vacant on what has been locally known for years as “Mosteller’s Corner”, a nod to Chester County’s once-largest department store, Mosteller’s. This month, demolition will begin on the buildings in preparation for a mixed-use urban infill project titled 44 West. 44 West is a 45,000-square-foot mixed use building comprised of offices, retail space, and fine dining restaurants. Unique to this project is the large corner plaza which is designed to serve as a “gathering place” and will feature art installations and a fountain. The intention of the project’s design is to resonate with West Chester’s heritage while still bringing a sense of modernity to its urban landscape. While the proposed reconstruction has brought both concern and controversy to the beloved corner, this is not the first time the property at the corner of Church Street and Gay Street has transformed. It has changed over many times throughout the centuries, and typically, in the times that the property itself has been totally transformed it’s often related to matters of economic health. According to Dr. Jim Jones of the West Chester University Department of History, the earliest recorded business located at Church and Gay Streets was a hotel built in 1786 called Cross Keys. Despite changing owners and names many times over the years, the original building remained until 1873. Records dated 1871 show images of the hotel as The White Hall show a four-story building with a second-floor balcony overlooking Gay Street. The White Hall Hotel eventually fell to the competition of more modern hotels in the area as West Chester enjoyed an economic boom following the end of the Civil War. It was eventually acquired by a local grocer and it was then that the property was converted for retail use. Decades later the corner and its property would be bought by a buyer by the name of James Mosteller. Mosteller fully acquired the property and the surrounding buildings along the corner by 1925. Over the next thirty years, the Mosteller family would continue to develop and expand their storefront three times over well into the 1960s – becoming a major retail presence in West Chester and evolving into a local institution. Now fifty years later, and following a decades-long stint as the office space for Chester County Courthouse, Mosteller’s Corner sits vacant. “It takes a pedestrian five seconds to decide whether or not they want to continue walking down an urban street. They make this decision based on the town’s streetscape which is typically comprised of storefronts and restaurants. Right now, there are so many small businesses along both Church Street (going south) and Gay Street (going west) that might not be getting as much pedestrian traffic as they should be because of the vacant area currently taking up much of the block. The intersection of aesthetics and economics is an interesting element to consider in terms of how our urban landscapes grow and evolve. 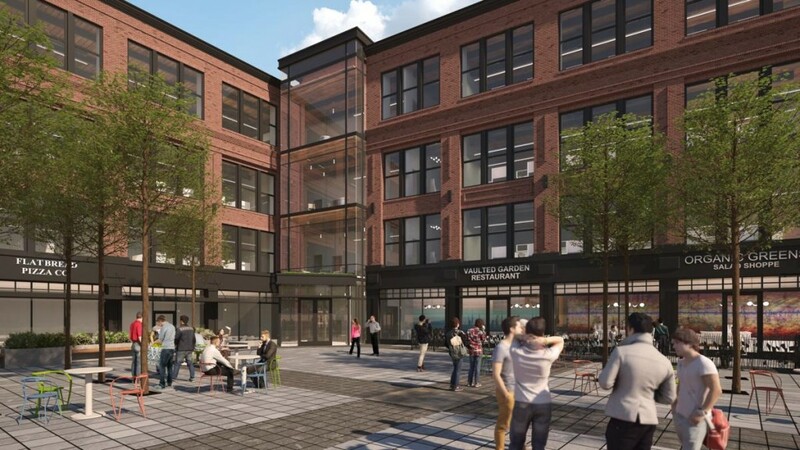 West Chester is one of southeastern Pennsylvania’s most unique towns, and with its bustling downtown, its urban character is sure to continue to evolve, and the addition of 44 West at Mosteller’s Corner will certainly usher the borough into a new, modern chapter. 44 West is set for completion in 2019.